Have you ever asked, “Why do we place such an emphasis on preaching?”. If so, that’s a great question. A very important one too! At DS Church, we believe that preaching the Gospel is a big deal. Our staff dedicates much time to brooding over the Word, pleading for direction and understanding of each text and works hard to ensure that the Word of God is communicated in the most informational and applicable fashion. Those who attend our worship services find that preaching is the central aspect of what we do as we give it top priority and the majority of our time together. The question is “why?”. At DS Church we understand the essential quality of preaching if we are to be a Biblical, New Testament Church as well as the deep need of man to hear passionate, accurate and powerful exposition of truth therefore we make a big deal out of it! A sad, sad trend of todays local church has been to downplay the importance of the preached word and many have abandoned it all together, considering it outdated or irrelevant. Short and shallow “Talks” now seem to rule the day. At DS Church, you have our commitment as a Staff to keep faithful preaching at the forefront of our ministry. If that ever changes, we have no right to lead you and we would expect you to relieve us of our duties. Yes, we’re passionate about this….and here are a few reasons why. The book of Acts is saturated with preaching. To miss this is to miss the whole book. Preaching was not part of the expansion of the first local churches, it was the primary means by which the local church launched. There are no fewer than 19 significant sermons recorded in the book of Acts alone. The preaching of Peter, Paul and Stephen alone accounts for nearly 1/4 of the book. You can’t understand the beginning of the local church and it’s expansion without understanding the importance of preaching to the local church. 2. 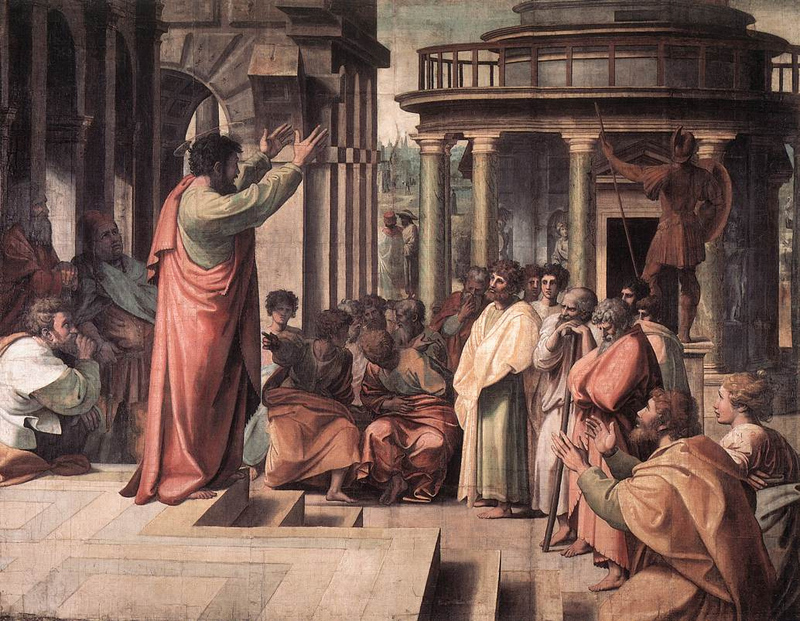 Preaching Was Central To Gospel Proclamation and Doctrinal Teaching To The Early Church. If this was true of the early church…Why wouldn’t it make sense for it to be central to the local church today? In some churches, it seems as though music has trumped preaching or at least is made equal with the preaching of the Word. Why is this? It’s well-known that DS Church values music. We’re grateful for our worship leader, musicians, choir and our vibrant congregational singing. We believe it to be an extraordinarily fruitful and Biblically commanded aspect of our corporate worship, but it does not trump preaching. Again, back to Acts…I believe music (Psalms, Hymn and Spiritual songs…funny, no mention of secular music…but I digress) was a HUGE part of the mission and ministry of the early church but it never usurped preaching. Never. And it should not today. We know that music, style, atmosphere, and the culture of the church is very important. All of these are part of the DNA or the identity of a particular local church, but we can’t shy away from putting the expository preaching of God’s Word first for it is central. It is direct Revelation from God to man. The preacher humbly functions as a called mouth piece to dispense what God says to the church, like Paul, Peter and other church leaders did in the book of Acts and the rest of the New Testament. Music (and all other components of the service) is there to support the preaching of the Word, never to trump it or replace it outright. It was the Apostle’s Teaching that was the most important part of establishing the believers and advancing the Gospel (Acts 2:42-43). Music and other activities, when rightly viewed, pave the road toward the preaching of the Word of God. Themes of songs, words spoken, and other parts should “set up the preacher“. Too many songs, spoken words, transitions, etc can deter from the theme of the preaching, become distracting, and hinder the Holy Spirit working in the life of those God desires to speak to through the preached Word. Of course, the same can be said about the preacher. That’s why it’s imperative that the preacher vigorously (and continually) works at his craft and that he remains true to the text before him. If not, he runs the risk of becoming a poor communicator at best and a self-exalting communicator at worst. For instance, if he hears from a congregation, “What a great preacher!” instead of “what a great God!”, it may boost his own ego but he has become the distraction, hindering the work of God. Paul shared his passion for preaching to the Corinthian church when he said, “For Christ did not send me to baptize, but to preach the Gospel” (1 Corinthians 1:17). This was Paul’s way of putting the priority on preaching for the Corinthian Church and all local churches. The writer of Hebrews tells us to “remember your leaders, those who spoke the Word of God. Consider the outcome of their life and imitate their faith” (Hebrews 13:7). The spoken Word of God is critical to Gospel advance and to the believers growth in Christ. It’s the climax, or high point, of what we do weekly as we gather for corporate worship. The local church is not a club, entertainment center or social organization. It is the pillar and foundation of God’s Truth. The vision, mission and core value of the church is to share the Truth of God’s Word for life-transformation (1 Timothy 3:15). This Truth should be the center of the worship service experience. I truly believe the health of any local church is directly proportional to the place of preaching in the worship service. Key word there is HEALTH…not size. Big churches (and small ones) can be unhealthy and unbiblical. When a church, like those in the book of Acts, centralizes Biblical preaching they are bound to be healthy God-honoring churches. Believers will not gather as critiquing customers, but hungry consumers of God’s Word. Those churches which place other elements equal or above the Word of God spoken are caving to the world’s short-term experiences. The result will be a starving congregation that will eventually lead perish to death. Faithful , effective, passionate preaching will produce long-term spiritual fruit for the glory of God. At DS Church, that’s what we are striving for. Next Next post: HUGE News……….